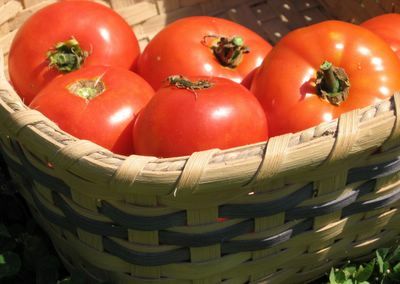 After a couple of days of unsuccessfully trying to come up with the perfect way to begin this post (including sitting and staring at a blank computer screen for minutes on end), I finally realized that clever, flowery prose extolling the virtues of homegrown tomatoes to gardeners and foodies is totally unnecessary. The tomatoes are ready. Enough said. Either you get it, or you don't. (And if you don't, we need to have a serious talk as soon as possible.) So now that we have that settled, I'm going to skip the chit chat and simply tell you what I do each summer as soon as there are at least a few handfuls of ripe tomatoes out on the vines. 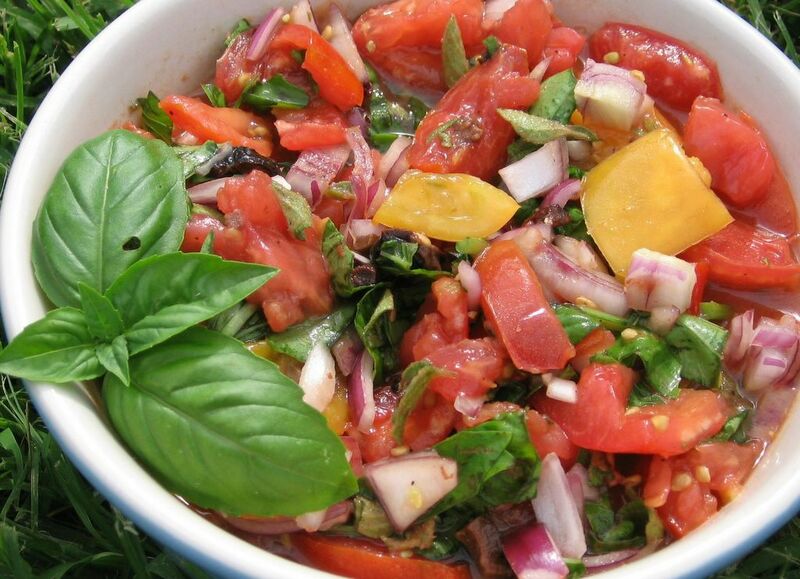 I call it Summer In A Bowl, and it is so easy to make it can hardly be called a recipe. To me it is the essence of summer. It's another example of the Less Fuss, More Flavor way of cooking I find myself turning to more and more. Over the years, I've simply learned that the better the ingredients, the less you need to do to them. And that, to me, is pure kitchen bliss. So go find yourself the best tomatoes you can, toss together this basic recipe, and then let your imagination run wild—or simply eat it all up straight from the bowl with a spoon. Note: Any ingredient aside from the tomatoes can be omitted. Toss in some chopped garlic or garlic powder (click here to learn about my source for top quality herbs and spices at amazingly low prices), and some good salt & pepper to taste. Stir everything together with a large spoon until thoroughly combined. You will probably be quite content to eat several dozen servings of this before you begin to think about what other things you might do with it. But this is where the real fun begins. Here are enough ideas to keep you chopping up and celebrating your bounty of garden fresh tomatoes (no matter whose garden they come from) for the rest of the summer. The easiest thing to do is to add one special ingredient to the basic mix. Almost anything you love will work. This time I used a few Oil Cured Moroccan Olives I discovered languishing in a jar in the fridge. I chopped them into tiny pieces and their pungent flavor and super saltiness provided just the right touch. You could also add practically any other kind of olives, or some of those beautiful fresh caper berries you can sometimes find on gourmet olive bars. Or chopped anchovies or a smidge of anchovy paste. Or a handful of pinenuts. Some freshly chopped sweet red pepper or a few roasted red peppers from a jar would slide right in quite nicely. You could add cheese, such as freshly grated pecorino romano or some of those baby mozzarella balls that come swimming in delightfully herby olive oil. Stir in crumbled up feta with kalmata olives, or chunks of rosy pink leftover roast leg of lamb and diced sharp cheddar. You could even toss in some day old cubed French or Italian bread or a can of garbanzo or Great Northern beans. And how to serve it besides straight out of the bowl? On toasted baguette slices or next to a plate of eggs. Tossed with homemade fettuccine or a package of pasta spirals. Piled on a bed of fresh greens with big garlic croutons and freshly grated parmesan reggiano sprinkled on top. Stirred into some nice cooked lentils or a stash of leftover rice. Spooned into warm homemade pita breads. I warned you the possiblities are endless. Enjoy. © Copyright FarmgirlFare.com, the vine-ripened foodie farm blog where Farmgirl Susan shares recipes, stories, and photos from her crazy country life on 240 remote Missouri acres. Fantastic! I have to get my tomatoes from the farmers market. In my west coastal garden mine are still green! That is what I made last night for dinner tossed with whole wheat penne, some beautiful black olives and cannelini beans. Yum ! If sweet Cary hasn't eaten all the arugula flowers, scatter a handful over your tomato salad. Pure poetry, and delicious too! My favorite food in the whole world is a tomato, plain, with just a little salt. But your recipe sounds delicious.
. . . but, I think I might add a little cilantro . . .
i knew we could count on farmgirl -- saving the planet, one homegrown tomato at a time. brava, bellissima! kevin, adding the cilantro begs for a little avocado & a teeny pinch of cayenne, but be cautioned you may invite the scorn of the purists. feel free to blame me, but call it salsa. is a quick plunge into boiling water to loosen the skin too bourgeois or simply heaven? one last suggestion: try a mild goat cheese in place of mayo, on a well-olive oiled ciabatta, yeahyeah don't forget the basil maybe even a dollop of kalamata olive paste. play pink martini's hang on little tomato cd. No need to boil water to skin ripe summer tomatoes: just draw the back of a small knife firmly down the skin, from pole to pole, all around and it will zip off easily. MMmmmm....truly summer in a bowl. My version is tomatoes with lots of basil, some fresh cippolini onions, kalamata olives, baby mozzarella, and homemade croutons rubbed with fresh garlic. Drizzle all with olive oil and a little balsamic. And that is dinner. Looks wonderful. As soon as my tomatoes ripen, I'll make my own version of Summer in a Bowl with your 'guidelines'. And thanks for the tip on the cucumbers. I have plenty of those right now, and generally just eat the smaller ones whole, like a piece of fruit or a candy bar. Yum! I found this glorious blog and tried the tomato recipe for dinner tonight. It was divine! I can relate to the farmgirl thing, I live on 40 acres in Upstate NY. Love the country and everything about it. My friends think I'm nuts but I wouldn't trade a day on *Walton's Mountain* for a place in the city! I'll be visiting your blogs often! Just bought some homegrown tomatoes in Oklahoma yesterday on a return trip from Kansas. This recipe sounds so very delicious! Do you have a favorite recipe for Fried Green Tomatoes? my favorite simple tomato recipe is solely based on timing. pick the tomato in the heat of the day when the temperature of the fruit is as close to 98.6 as possible. don't leave the garden. for heaven sake don't even get close to a refrigerator. just take a bite and let the juices spurt and trickle where they may. warning: if you have more than 20 tomato plants you might need to hose yourself off before entering the house. One of my favorite books to read to my daughter when she was younger was "First Tomato Soup" (http://www.amazon.com/gp/product/0803711751/103-6618526-4208649?v=glance&n=283155). It described the excitement around the first tomato of the summer, and how the resulting soup was a gift for someone special. :) Cheers for summer. Yes, to hell w/ the pretty prose and on w/ the flavors of summer!! Fabulous!! That's my favorite way of cooking, too -- using very good ingredients and keeping it simple. Those tomatoes look wonderful. I tried this at the weekend using the remnants of my "Striped Blister Beetle" ravaged veg plot here in NE Oklahoma and it was excellent. I made this salad for dinner Friday night after a trip to the local farm market ...It was delicious - thank you!